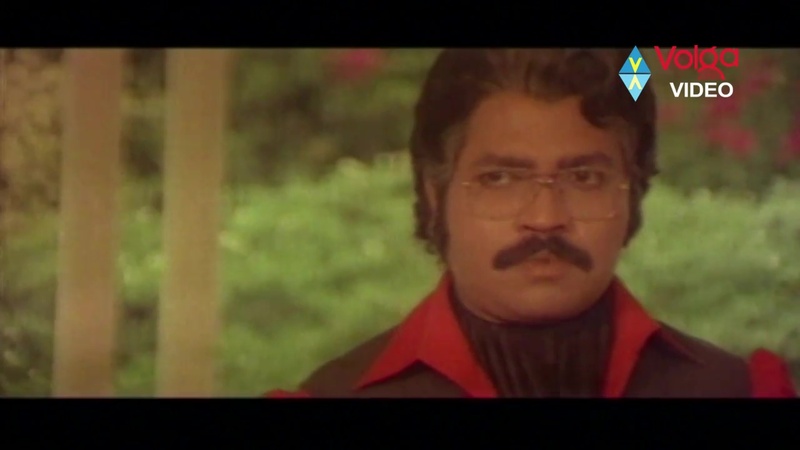 Rakshasudu is all stops out mass from A Kodandarami Reddy. Chiru is The Nameless Hero, there are many people known by initials only, and you can’t go past his back up team of Nagababu, Suhasini, Radha and Sumalata. Evildoers beware! A woman (Annapurna) goes into labour in an orphanage or children’s home. The unscrupulous owner (Allu Ramalingaiah) steals and sells her baby boy to a beggar who uses the kid to augment his begging routine. He is not a loving father figure, and physically abuses the child. The kid fights back, demanding to know where his real parents are, and one day finds himself sold and on the way to a mysterious island where he will work as a slave. 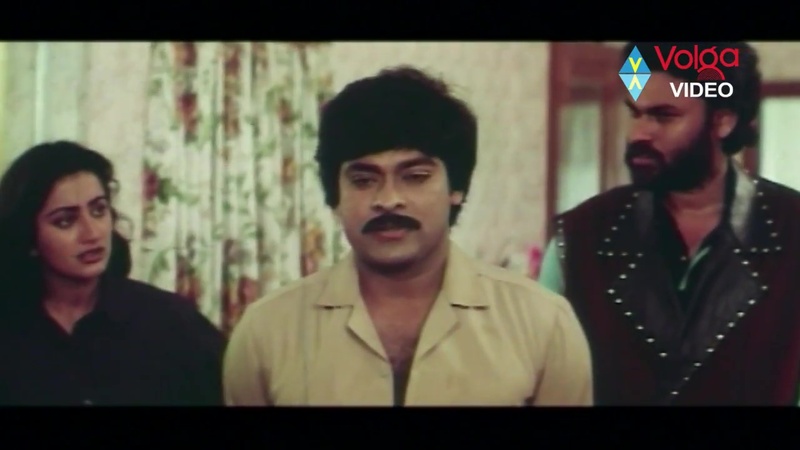 The nameless child grows up to be Chiranjeevi. 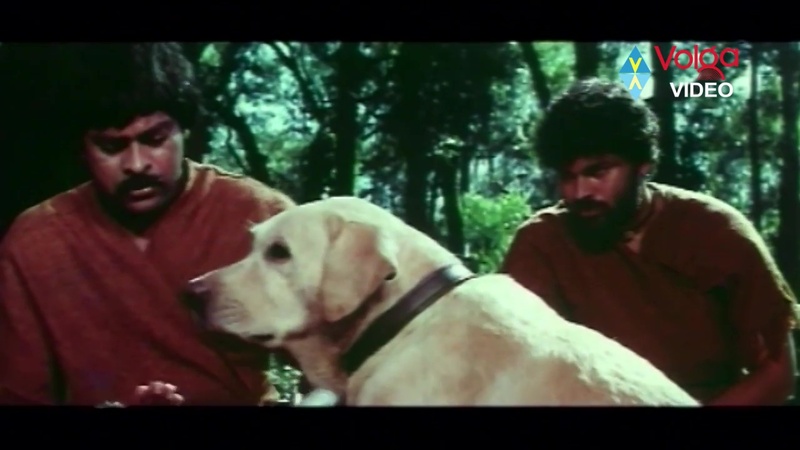 In due course Chiru escapes the island, along with his bestie Simham (Nagendra babu) and an excellent dog. He goes to the orphanage and demands to know where his mother is. 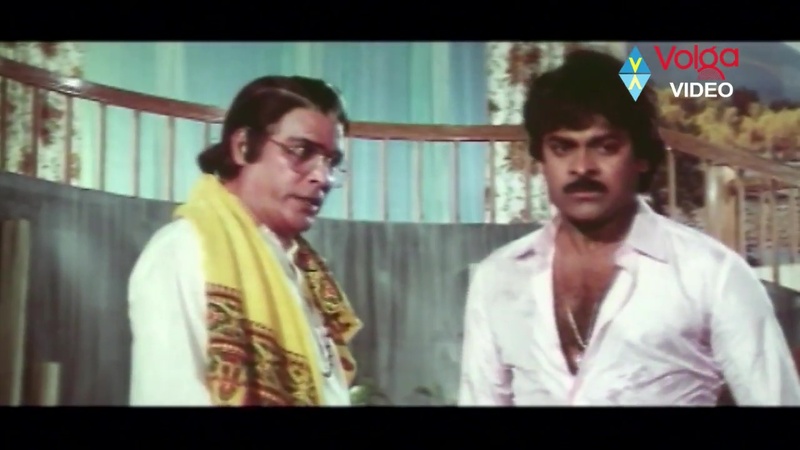 Allu Ramalingaiah asks for a large sum of money in return, and Chiru duly goes to steal it. But he is caught by wealthy JK (Rao Gopal Rao) and they make a deal. Chiru will terminate evil VR (Kannada Prabhakar) who owns the island where he was imprisoned, and JK will help him find his mother. JK’s relative or assistant Vani (Sumalatha) is already on task regarding VR. She helps Chiru meet Shailu (Radha). Shailu is smitten immediately but he isn’t keen except that she is VR’s daughter. This opens up a whole new avenue of revenge for Chiru. He keeps an assignation with Shailu who sends a lot of mixed signals by bouncing on her bed and thrusting at him. What is he to make of it all? As soon as is decent, he is off to her dad’s place, presumably to announce he is out for vengeance and BTW about your daughter’s virginity…It doesn’t go down well with VR. But it is kind of amusing to watch the alpha male posturing backed up by handy photos. I would have been asking where the photographer was hiding but Shailu doesn’t care. She just wants Chiranjeevi. Poor Radha. She is doomed to be second fiddle, although she does her best to be unmissable. But Chiru is not all about being menacing and duplicitous. 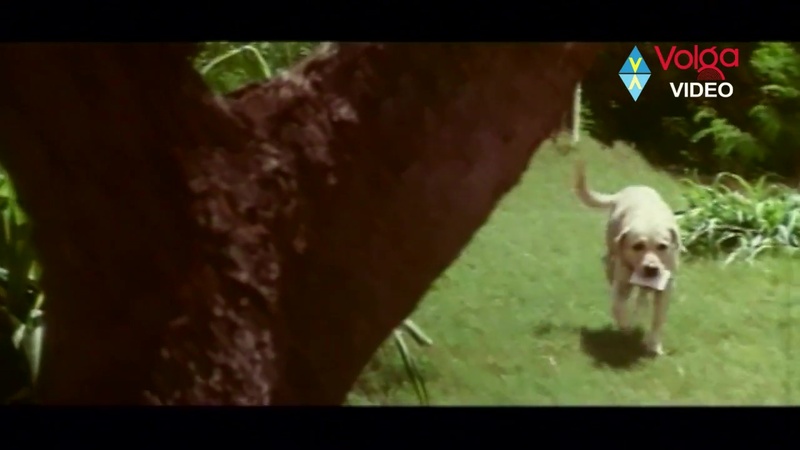 Sumathi (Suhasini), a teacher, is dragged by a podgy Labrador to the river bank where she finds an injured Chiru. I have no idea how he got there, but I assume VR is responsible. Romance clearly starts to bloom as he convalesces, and her students find this a riveting spectator sport. Via flashback we see how VR killed her family when they were preparing to celebrate a festival. 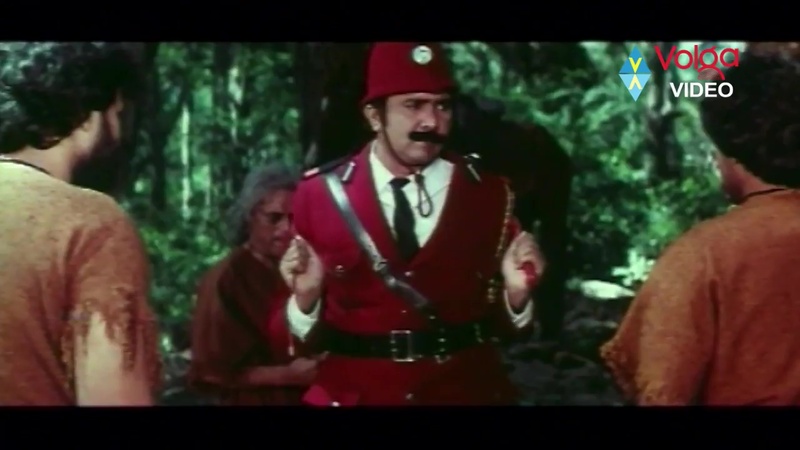 I think only Sumathi and her policeman brother Vijay (Rajendra Prasad) survived. Suhasini and Chiranjeevi seem to have good chemistry. In amongst all the wild shenanigans she looks like she is genuinely amused at some points but then I remember. Suhasini is a great actress. 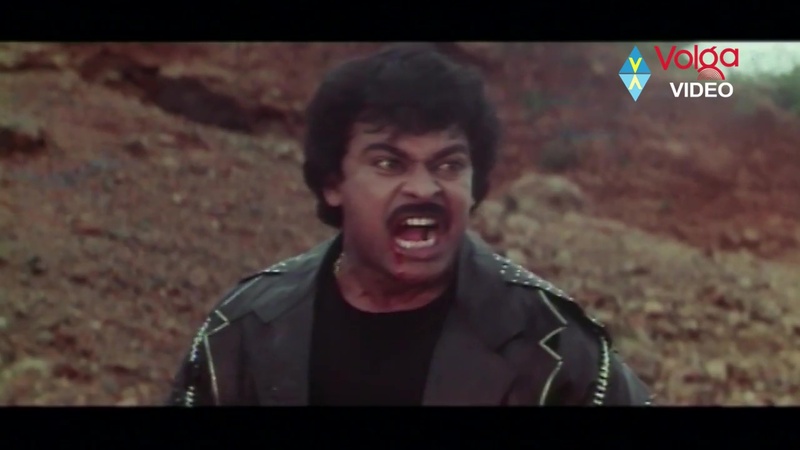 Chiru is even more fired up for revenge now he knows who killed Sumathi’s family. He loves her and wants to start dishing out the comeuppances. But first he has to deal with Shailu and her incessant groping. While I don’t really like a lot of what his character does, especially when it comes to Shailu, I like the performance a lot. This role has the full Hero gamut from wisecracking to arse kicking and a whole lot of emo wallowing and shameless flirting. And random songs. My notes here say: Song! Snow! Sleds! There are so many flashbacks. Chiru recognises an old man in a photo in Sumathi’s album, and that sparks a memory of when he helped a Golden Labrador with a leg injury. His kindness was repaid in spades. When Chiru ends up high above the ground, strung up between two trees, the dog climbs a tree and crawls out along a branch to untie his human. What an anipal! And maybe it’s the same dog who is delivering his love letters. Of course, the problem with sending your love letters by Labrador courier is that you may not be communicating with who you think you are. 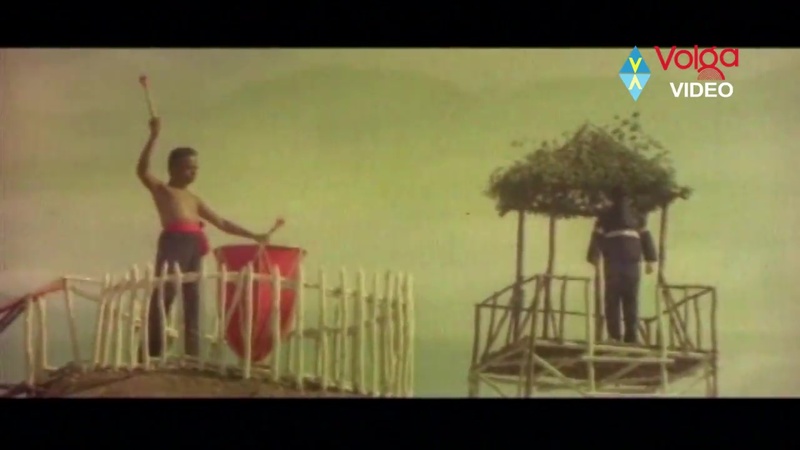 Chiru dreams of Sumathi but Shailu asserts herself in the song fantasies, perpetuating the love triangle that nobody is aware of. Yet. 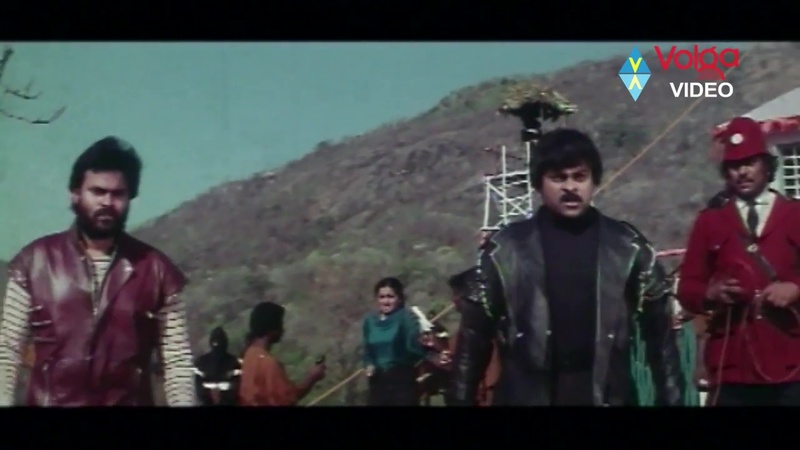 Back in the island days, Chiru’s impressive high kicking fighting style wins the affection of VR’s lady friend, Jayamala. And that leads to the gladiator mini-skirt song. Given the robes the slaves wear, the mini dress kind of makes sense as a glammed up version of his work uniform. So if nothing else I am grateful to the film for clearing that up. But Chiru is not to be hers. Of course he winds up in a Love Parallelogram. A Triangle is simply not Mega enough! In the present day, Shailu sees Chiranjeevi with Sumathi, and her head splits into two with a nice montage happening where her brain should be. She is devastated. The end of the film brings closure to many of these tangled relationships. Usually by killing one of the people involved. There is a classic Masala Death Trap, needlessly complex shenanigans, feats of improbable strength, red paint galore. Who will live happily ever after? And who will be crushed by the Mega-boots? 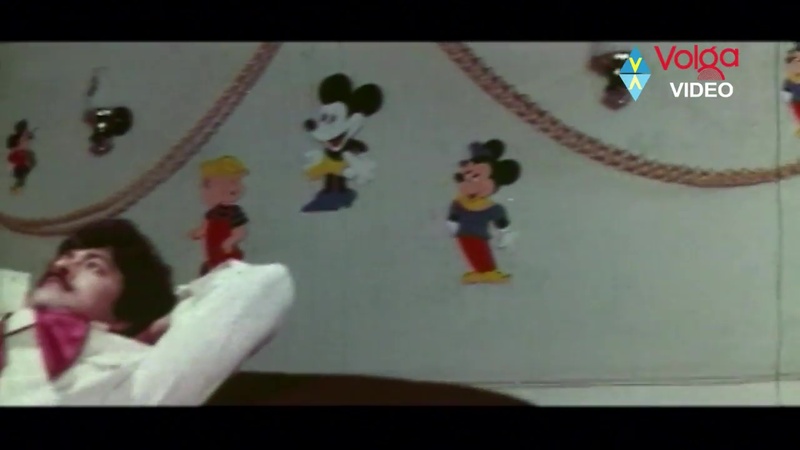 This entry was posted in Tollywood and tagged A. Kodandarami Reddy, Chiranjeevi, Chiru, Jayamala, Kannada Prabhakar, Nagendra Babu, Radha, Rao Gopal Rao, Suhasini, Sumalata, Telugu. Bookmark the permalink.